As promised. This is the bowl I was working on last weekend. I did this one for my wife, who will give it away as part of a charity fund raiser. Anybody who donates to the fund gets their name put in the pot, she'll hold a drawing at the end of the fund raiser and the winner gets this. This is a local deal only, specifically for the division she manages at her workplace - no, you can't get into the contest, sorry (though if it works well, I might hold a "Help Jim raise money to buy a new server to replace the one he fried last week" contest...). As with most of my stuff, this is made from Baltic Birch Heartwood that I harvested in South Central Alaska. It's green turned, i.e. the wood is not dried first. Green turning requires skills and techniques different from turning kiln dried stock, and very, very sharp tools. After turning, the rough bowl is sanded on the lathe and then burnished (polished at high speed using a handful of damp wood shavings) which gives it a deep iridescent glow and satin smooth finish. Then I cut the filigree and texture the outside to highlight the heartwood veining patterns using a Foredom rotary tool. 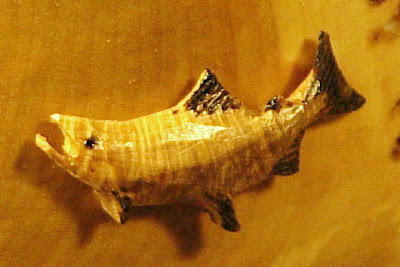 Following that, I add red salmon, carved from cross-grain cut birch scrapwood. The whole thing is soaked in Walnut oil several times to force out the remaining water, and then polished to a glossy finish. I am particularly happy with how the cross-grain patterns make the carved salmon more interesting. Update: just in case you're curious, this bowl is about 12 inches in diameter, and about 5 inches deep. I find I'm becoming covetous. Ooh, pretty. Let me know when your show is in Anchorage, I might be able to make a visit combined with a work trip. The cross-grain on the fish looks like light through water. Very nicely done, you should be pleased. Holy crap, Jim. My origami pterodactyl making skills are seeming less impressive. Seriously, that's incredible. How long does a piece like that take you? Shawn, It depends on whether you include the tree harvesting and blank making process. Harvesting is usually several days of backbreaking labor, but I normally end up with a enough wood for several months. Blank making involves cutting the logs into slabs, and then into rough cylinders that will be mounted on the lathe. That also takes a couple of days, because I do them in batches. The actual turning, from blank to rough bowl shape, takes only an hour or so. 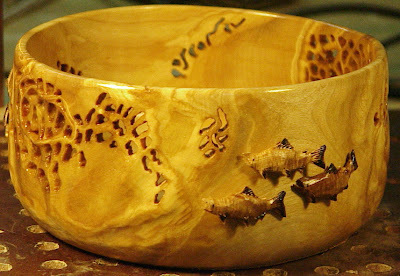 But the carving, texturing, and oil finish, like the one in this post, takes about a week. Altogether, a bowl like this one represents roughly 60 hours of work - though some of that time is multi-tasked with other projects (I make the fish in batches large enough for several bowls, for example). All, I swear I'll have enough to offer you all a nice selection come January, unless I sell all of them at the show in December! And I can pimp your stuff to my friends and family in the area. Exploit my extensive network of art loving geeks!! Tania, I'll post the details as soon as I know them. I don't have dates yet, it's going to happen but the best I can do at the moment is say - sometime in early to mid December.